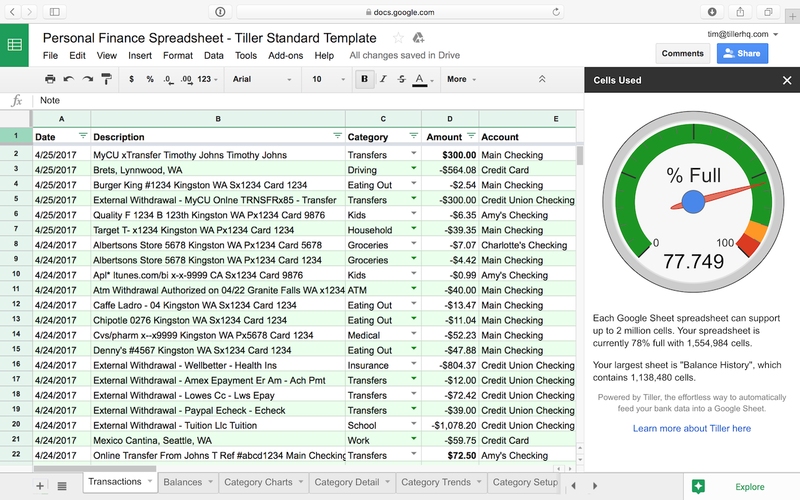 Learn how much data one Google Sheet can store. Tiller Sheets can have a maximum of 2 million cells. However, most users don’t hit this size limit. If you do reach this limit, you can create a new sheet and cut/paste some of your older Transactions or Balance History rows into this new sheet to shrink the size of your active Tiller Sheet. You can also use the IMPORTRANGE formula to pull your transaction data into a new Google Sheet that's not linked to Tiller. If you're concerned that your sheet might fill up because you've been using Tiller for a while, or you're using advanced queries, reporting, and functions you can install our Size My Sheet Google Sheets Add-on to monitor your sheet's size. The Size My Sheet add-on requires two permissions to run. 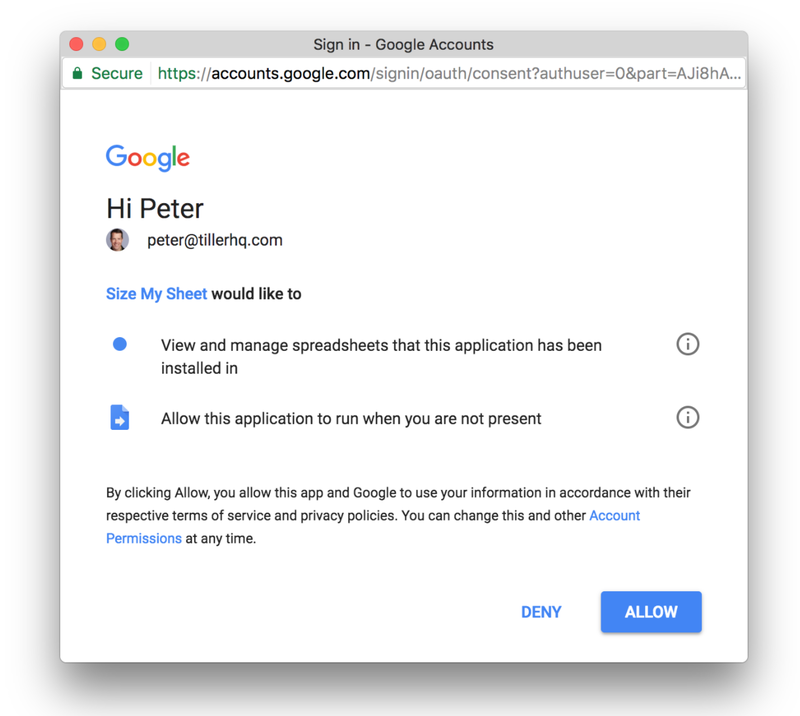 Google Sheets add-ons don’t provide a lot of detail about these permission requests, but the access is very straightforward. The add-on itself is asking permission to view your spreadsheets (so it can size them) and to run on its own (so it’s available in your menu bar when you need it). The add-on does not store any data about the content of your spreadsheet, nor does it share any of your spreadsheet data with Tiller. Google tells us how many people install this add-on and the number of weekly users, and that’s the limit of the information we see about how or where it’s used. We’ve also made the source code available on GitHub.